Dean Smith Endorses Obama; Is Coach K Next To Endorse? Duke and North Carolina’s basketball programs have become more entangled with presidential politics than perhaps any of their competitors. Reggie Love, a former Blue Devil walk-on, is Democratic nominee Barack Obama’s bodyman, and last year, Obama ran in a five-on-five scrimmage with the Tar Heels, astutely observing that the players on this year’s preseason No. 1 were “a lot better” than him. Lest you think Obama has an unbreakable allegiance to the Tar Heels, he did ball wtih former Duke point guard Chris Duhon and 6-foot-7 former Duke center Alison Bales last year. And now we can add this curveball to the equation: legendary North Carolina head coach Dean Smith and his wife, Linnea, endorsed Obama in an e-mail sent to Obama supporters Monday morning. (E-mail after the jump.) Apologies for mixing sports metaphors. Further apologies for cliched metaphors. Smith has made his move, supporting the increasingly popular candidate in this state that has swung from Republican stronghold to battleground to leaning Democratic in the past year. It’s not likely that Krzyzewski supports the same candidate. But will he endorse Republican presidential nominee John McCain? Given the ensuing firestorm the last time he made a political move, we don’t think so. Then again, his national profile has never been higher having led Team USA to a gold medal in August. Moreover, should Krzyzewski publicly endorse? That is, is it the role of a college basketball coach to send out an e-mail to an (undisclosed) list of political supporters? (We must note that there is a difference between Smith and Krzyzewski; one is employed by a university, the other is not.) Professors are free to make their views public, and some are actively engaged in the local political scene. 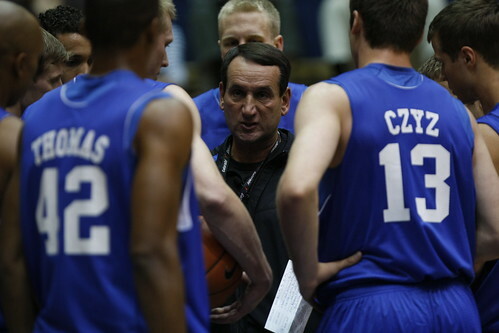 Then again, Krzyzewski is in a different position than your average tenured English professor. It is possible, after all, to associate his endorsement with that of the University–which is the exact reason Duke President Richard Brodhead has abstained from commenting publicly on the historic race. It’s certainly something worth asking Krzyzewski at his first press conference of the season Friday. After all, the difference between Smith and Krzyzewski has has once again proven to be more than just a slight shade of blue.